What did your teammate do before landing a GP2 drive? 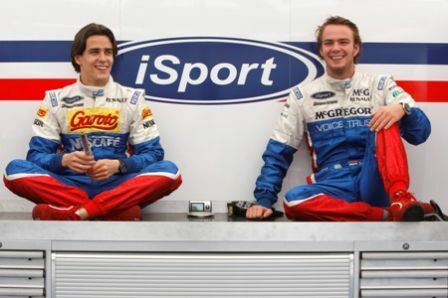 Giedo: F3000… before GP2 you know. Diego: Ah! I didn’t listen to the question! Giedo: It’s started you know. Diego: Sorry (Laughs). You were in World Series by Renault. What are his greatest strengths? Diego: Slow speed corners… (Laughs) If we put everything together we win everything! Giedo: That’s a good one… (He thinks) I think sometimes he forgets some stuffs. Diego: I don’t know… I have no idea. I haven’t seen a weakness yet. Who gets the latest to the track? Diego: We always come together. Giedo: So we are never later or earlier. Sometimes, we even hold hands. Diego: (Laughs) I arrived nine minutes late to the signing session this morning, but I followed the GPS. It’s sh*t! “In one hundred meters, turn right”. I turn you know. I think it knows better than me. Then I get stuck in traffic. Boom! I’m late. Who is the wildest on track // off track? Giedo: No, on track, there’s not a lot of difference between the two of us. But off track, you are the wildest. Diego: No! You are much crazier than me. Maybe because you are Dutch… I think we talk too much. It’s true, but it’s ok.
Giedo: We are not so wild on track. Diego: We are both almost married you know. Giedo: So we are not looking for girls. Diego: We are still both successful. My girlfriend is nice so we are both lucky. Giedo: I got together with my girlfriend six years ago and you have been with yours for five… So… When I finished Go Kart I had some time off and I met her and we are together still. Who will have the nicest car in ten years? Diego: Giedo wants an airplane! Giedo: I would like to be in a F1 in ten years and in one of the top teams of course! Who will have the most beautiful wife in ten years? Diego: I hope me! But I already know that mine will be the loudest though! I swear! Put two Brazilian girls together and it’s like you are in a chicken coop! When my girlfriend’s sister is here with my sister and my girlfriend come to the races, they never shut up! (Laughs) And then you get Valerio sitting there, laughing his loud laugh! 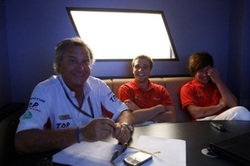 Giedo: d’Ambrosio is also bad when it comes to laugh you know. How best would you describe your teammate? Diego: Same. We are similar: we are not shy, we talk a lot. Giedo: For me, it has not been an easy year although it’s going better now. But as a teammate I couldn’t have had a better one. Diego: No! No way! I’m sorry, but I have to reveal that you wear pink underwear all the time! And you like to show them! It hurts the eyes! Giedo: Whenever I change and you walk in on me, it’s true you do get a little bit scared of my choice of underwear. Diego: I took pictures. You want them for the blog? I mean it’s pink! You have to take a picture or no one will believe you! I mean, he was checking the data in his underwear! I have at least five pictures. Giedo: Hey! It’s good fashion to wear pink underwear. In Holland, we have good and big brands like McGreggor. Giedo: I think I am less than you. Diego: No. I’m worse than you? Giedo: You have to know people first. You are always shy in front of the camera. Who is your favourite sportsman? Sportswoman? Diego: Can I say Senna? Giedo: For me Lance Armstrong. Diego: Bolt! And woman? The Brazilian girl married to Pizzonia: Maureen Maggi. She’s very good. She won the Olympics. Giedo: I don’t watch women’s sports. Giedo: I think it’s 50/50. I tell bad jokes all the time! Diego: You like to joke with me. Our first test in Barcelona, I was having a yogurt and he told me: “Did you smell that? It smells really bad; I think it’s not good anymore”. So I smelled it and he spread it all over my face. He did the same to my girlfriend with some ice cream! Giedo: Yeah… It’s a bad joke. Diego: But we are working on how to get him back. Diego, if you were to invite Giedo to dinner, what would you cook? Same for Giedo? Diego: Ah! I was expecting this question! Giedo: I think I would not cook Italian because that’s what we eat at the track… Probably some Dutch food. My girlfriend can cook also Japanese or Chinese. I know how to cook eggs! Diego: I would cook feijoada. It’s like black beans with some pork in the middle and caipirinha! Diego: But to us it’s typical food! And rice… And Brazilian stuff. Giedo: I’ll have a beer. Giedo: Diego has two phones so he wins. Diego: I think I have 18… Wait… I have two phones. Diego: I have the same contacts in both phones. Giedo: I’m sure we will lose to Karun Chandhok no matter what. I have 333. Diego: How can you see? Diego: No, look I have more than that in this phone. (As he scrolls down) A, B, C, D, E… It has to be more than 50… Ah! 170. That’s better! Giedo: It says you have 900 voice mails. Diego: No! It’s the number to call the voice mail stupid! Giedo: I like to make fun of you. Diego: I have 170. That’s good now… So how many did you say Chandhok has? Diego: What? How is that possible? No, seriously. I need to give him my phone. Or maybe he already has it! I’m gonna go around the paddock and go “Hi! I’m Diego. Can I have your phone number?” to everyone. I hope this will help me beat him. Giedo: I don’t care. As long as I beat him on the track! Diego: Ok, but I have twitter and maybe I have more followers than him! Alvaro: I think he did World Series, but maybe not all of it. And Formula 3 in England for sure. Alvaro: He is earlier on track, for sure (Laughs). And during the races, he is very consistent. Karun: I think, Alvaro’s greatest strength is how he can just wake up and five minutes later be on the track and be super fast! Can you tell us the story of your pole position in 07 in Monaco? Karun: Probably, maybe in the races more than in qualifying, he is very quick on one lap… He is mega. Maybe he is not as quick during the races, maybe. Karun: Unless we have a problem, we are always between one or two tenths from the pace. We haven’t been the luckiest pair. Karun: I couldn’t believe it! He called me. It was the first time ever! I got to the track and saw him there already. I really thought that he’d slept there at night: it was impossible otherwise! I’m sure he didn’t change the time zone on his alarm. Karun: I don’t know. It depends… If you look at the end of season party last year? It was probably me. If you look at the rest of the year, probably him. Karun: The last time I was in Portugal, we went out for dinner. Some of us went to bed after dinner. Some of us went to Portimao after dinner… and came back at five in the morning. I will not say who was who, but I will say this: I was in bed! (Laughs) On track, I would say we are even in terms of wilderness. Alvaro: This year, for me, it’s been a bit crazy. I think I made only one big mistake and another small one in Monaco. But the rest has been people hitting me. I haven’t had a great year so far. We should be more in front. Anyway, that doesn’t change anything… The year has been difficult and we lost a lot of points through no fault of our own. Karun: People crash into you and I have mechanical gremlins… We should have had three more points, that’s for sure. And there were stupid incidents as well. But, there you go. We are definitely the unluckiest pair of the grid. Alvaro: We should be a lot more in front. Karun: You are a smooth talker. Alvaro: Oh and you are not? (Laughs) I’m a low profile person. I’ve heard some stories regarding Karun… But I will not tell! Karun: I don’t know… I want the world’s fastest Fiat 500. That’s what I want. When I make money, that’s the first thing I’m going to buy. The world’s fastest Fiat 500… It will be mega. I could drive from Brackley to Spa in less than five hours. Alvaro: And you will also have a lot of tickets. Alvaro: For me, right now, if I could buy a car, I would buy a sporty diesel – something like a BMW. I really like them. That’s what I would do right now. I had a non-diesel car. I loved it, but I was constantly at the petrol station, filling it up. Karun: I’m driving a diesel Volvo at the moment for the same reason! 450 miles with one tank. Happy day! Alvaro: I was going to say that (Laughs)! Karun: I don’t even know if I’m going to be alive in ten years…! Karun: Outside the track, it’s tee-shirt, shorts and flip-flops for me. Alvaro: You think I’m shy? Alvaro: Oh then yes. Compared to you, anybody is shy! Karun: True. To stay at the top year after year… He is a real hero. Alvaro: No, no. It’s Karun. Karun: Alvaro is quite funny, really. Yesterday, I was changing my visor. I got the dark visor and he comes up to me and says: “It’s raining again”. So, I spend another ten minutes getting the rain visor ready. And of course, it was bright and sunny outside. Alvaro: Sorry… (Laughs) But Karun has an English humour. It’s quite entertaining. Karun, if you were to invite Alvaro to dinner, what would you cook? Same for Alvaro? Karun: Portuguese are not very good with curry. Karun: My chicken curry is very good. I cook all the time. I make fajitas too. Karun: Ok, I will make you fajitas… To be honest, it’s not difficult to cook curry. I make everything from scratch. I love cooking curries. My dad always brings me some spices to England every time I run out. Alvaro: Where can you see that? Alvaro: Jesus! One thousand how many? Alvaro: Ok, well then, there is no need to check mine! Alvaro: I lose… Big time! What did your teammate do before landing a GP2 drive? Jérôme: He sold sushi in Japan! (Laughs) No, seriously, he was in Formula 3 Euro Series with ART. Kamui: He was selling French Fries… He won Formula Master. Kamui: I think his strong point is that he talks a lot with his engineers. I don’t. Jérôme: I think he is very good at adjusting to the car. Kamui: … (He thinks some more)… I don’t know. Normally, I don’t think about that kind of stuff. I usually just think about how I can improve myself. Jérôme: Just say something so I can prove you wrong. Kamui: I really don’t know. Jérôme: So basically, I have none. Moving on to the next question! Jérôme: It’s 50-50… It depends. Jérôme: But we are on time. So that’s what counts really. Jérôme: Do we really have to answer that question? It’s Kamui of course! Kamui: Not off track! I’m very shy and very serious. Jérôme: Yeah. Right! Come on! Don’t lie! Remember how wild you were when we celebrated our title in Bahrain? Kamui: No, no. You never know. Jérôme: You are quite good at chatting up with girls. Kamui: I’m not so good. Jérôme: Well, you try a lot. Kamui: Oh! But I have to say a Toyota! Kamui: Are you trying to get me in trouble?! Jérôme: Come on! What is your dream car? Jérôme: What? No Porsche or Ferrari? Kamui: Hey! Last time, you took my car to drive to Dams and you told me that it was a very good car! Jérôme: You think you are going to have a wife in ten years? I don’t think so (Laughs)… It’s a difficult question. Time will tell. Kamui: It’s not easy! Come on! What if my girlfriend reads this?! Kamui: This goes on the website! Maybe she will go to the blog and read this! I cannot answer that question! Jérôme: Kamui is a wild cat. Kamui: No, I’m like Alfred, my dog! Jérôme: No. Shut up. You do! Kamui: I have a Japanese style you know? Kamui: It’s different for every country. Who decides which one is the best? As long as I like it, it’s good. Jérôme: Yeah, but me, with a tee-shirt and a pair of jeans, I’m good to go. I don’t really care. Jérôme: Come on! It’s me. On the track, no. But outside, I’m the shyest! (Laughs) I’ve just realised that Kamui answers “me” to every question! Kamui: No, but I am shy. When I have to speak, I do it. But I don’t like it because I don’t always know the people. Jérôme: Today, it’s Usain Bolt. He is amazing. I like Lance Armstrong. I really like him too. Oh! And Valentino Rossi. He’s number one! Kamui, if you were to invite Jérôme to dinner, what would you cook? Same for Jérôme? Kamui: Cook? Japanese food. I’m a very good cook. My girlfriend is not interested in food! It’s so frustrating. She doesn’t care about food. I cannot have a sandwich for dinner, but she can. So I cook for myself. So, Jérôme, I would be happy to cook for you! Jérôme: I’ll make French fries and waffles. You love them right? But I don’t know how to cook, so I’ll ask my mom to cook for you (Laughs)! Jérôme: I don’t know. I never checked. Probably Kamui. Kamui: I always lose my phone. So I always lose my contacts. Last December, I lost my Japanese phone because I put it in the bag with everything else and then checked it in on the plane. And someone stole it at the airport in Paris. I didn’t finish the contract with the phone company. I received the invoice last month: it was of 2000 Euros! Jérôme: You did not finish the contact? You are crazy!! Jérôme: So how do we get in touch with you? Kamui: I don’t know! I lose my phone every two months… I lose all the contacts every time! Kamui: I always put my phone in my luggage and then they steal my bag at the airport. I’m sure in Paris there is a place where they sell stolen items. I’m sure I could find eighteen of my bags there! Jérôme: And maybe your phones too! Dani: We did the same. F3 Euro Series. We know each other well. Lucas: We spent one year in the RDD Programme together before being teammates for Fat Burner Racing Engineering. Dani was in F3 Euro Series last season. Lucas: I don’t know about that… You are professional, that’s for sure. Lucas: At this stage, his lack of experience in GP2. Most of the guys, even rookies like Hülkenberg, it’s not the same because they raced in GP2 Asia. Dani, when he arrived in Barcelona for the opening of the championship, it was the first GP2 weekend ever for him. Dani: For now, I’ve seen no weaknesses in Lucas. He is really strong both mentally and with the car. He’s the man! See? I’m lovely. Lucas: We share the same car. Dani: Actually, I’m the first one to wake up. Lucas: You are the first one at breakfast! Lucas: Well, on track, that’s proportional to the amount of experience you have, I think. When you are not that experienced, it’s normal to make more mistakes and to push more. Lucas: Definitely me, but I have a girlfriend. Actually, I would have been more successful if I didn’t have a girlfriend! Lucas: Actually, Dani will. He will spend all his money in the car. Lucas: My girlfriend is younger so she is more beautiful! Dani: I have the nicest girlfriend now, so, you know, my wife will look nicer than yours! Lucas: Definitely an animal! A lama! The one that spits! Lucas: Laughs Mufasa yes, but not Timon! Come on! Lucas: At the moment… He thinks Actually, I’ve picked up golf recently, and it is quite difficult. So, I might have to say Tiger Woods. Dani: Lucas. You are laughing all the time. Lucas: Are you kidding? I am the most serious person in the paddock! Dani, if you were to invite Lucas to dinner, what would you cook? Same question for Lucas. Lucas: What can I cook? I will make some pot noodles in the microwave. It’ll be ready in two minutes. If you want to eat, you eat. If you don’t, just go away Laughs. Dani knows how to make pan con tomate that is really good. Lucas: You did when we were at the RDD once. Dani: I would cook that again then. Anything to make you happy! And by the way, I would be very happy with your pot noodles! Lucas: I don’t know… But one day, I will be the President of Brazil. It will be very nice. Dani: Laughs “Who has the most imagination of this room” should be the question! Sergio: I know! F3 Euroseries. He finished second in the championship. Edoardo: You finish fourth in British F3 after leading a big part of the season. Sergio: Well, he comes to a circuit without knowing it, but he can still be fast straight away. He makes it look easy. Edoardo: I think Sergio is a great teammate. We have the same driving style. We can improve the set up of the car together. He is constant and never makes big mistakes. It allows him to qualify well. Edoardo: Off track? laughs We are both living in different places. We only meet on the track or the workshop. It’s difficult to find his weaknesses. But on the track, he is a complete driver. Maybe, he lacks of experience, but we both need it. We are both making mistakes. In qualy, he is more efficient than me I guess. Wasn’t I supposed to talk about Sergio’s weaknesses? I’m too nice! Sergio: We both want to arrive on time and as early as possible. We are competing. In the morning, I arrive earlier and sometimes he gets lost! Edoardo: We are both Latin! Getting up early is not our thing! Sergio: We are always on time. That’s what matters, right? Latin, but on time! Sergio: Laughs… Hmm… I don’t know: I think we are both very wild. I don’t know: it depends on the moment. If you are on a quick lap, you want to finish the lap. Off track, I’m pretty wild to tell you the truth! I don’t know Edoardo that well off the track. But I know I’m wild! Edoardo: On track, I think we are wild, but in the good sense of the word. You have to ask the other drivers to see if I’m wild or not. Probably they will tell you that I am, but I try to avoid contacts and to get the best results. And off track, I’m a pretty simple guy: sometimes I go out with some friends, but I’m not going crazy. Edoardo: My job is to be a racing driver. I put it in front of everything else. And I found someone nine months ago. Maybe I was wilder before, now I’m tamed Laughs. Sergio: Oh yeah. Big time! Starts showing some bracelets This is from my grandmother. This is something that a friend gave me. I always wear them. Edoardo: And I have stripes in my hair. I started wearing them last year and I won. So, yes, I am superstitious too. Plus, that way, I don’t look like the others! Edoardo: And what will it be? Sergio: I would like to have a Lamborghini. A yellow one! So that people see that I have one! Edoardo: Laughs of course! If you have to buy a Lamborghini, you have to buy it yellow! Laughs. A dream car for me is a good SUV like a Cayenne or a Tuareg because I live near the mountains. You know, being a racing driver, you already have the big sensations at the wheel of the best and most powerful cars in the world. On the road, for me, it doesn’t really matter if the car is powerful. I want it to be comfortable. Right now, I’m driving a Golf and I’m fine with it Laughs. Sergio: I’ll try to find her, but it’s difficult. I don’t even know if I’ll be married in ten years. I will still be too young I think! You cannot plan your life. Edoardo: When you are married, you’re like stuck Laughs. It’s not about being with someone beautiful it’s more about being with someone interesting. If they are nice looking, it will be a nice plus! Sergio: I think Edoardo would be a tiger Laughs or a snake Laughs Kind of! Edoardo: We are both fighters. Edoardo: I think Sergio has a better fashion sense than me. I am always wearing the same clothes. I don’t like shopping: it’s pretty boring! I steal clothes from my brother. I’m not really into fashion. Sergio: Everybody says I am very shy. I am shy to some people when they are strangers. It takes time for me to get comfortable around new people. Edoardo: I’m pretty shy as well. Growing up, when you are a racing driver, you are alone and you are getting used to it. For me, it’s pretty difficult to socialise although it’s part of our job as well. Sergio: Sometimes, my family thinks I don’t socialise enough, but I like to be on my own and I enjoy it. Sergio: Ayrton Senna. And Lorena Ochoa because she’s from my hometown. Plus, she’s really hot! Edoardo: I don’t know… Because I really like football: Cristiano Ronaldo. He is a natural and talented. But he is working so hard. Sergio: I think Edoardo does. When I’m with my friends, I make a lot of jokes, but not around the team. Edoardo: I’m joking pretty often or at least I’m trying! I like to create a nice atmosphere. It’s a good way to build a team. Sergio, if you were to invite Edoardo to dinner, what would you cook? Same question for Edoardo. Sergio: I actually cook quite often at home. I normally do microwave rice! Laughs It’s not difficult to make Laughs. If Edoardo comes to my house, I will cook something more difficult of course. Edoardo: I’m always cooking pasta because it’s pretty easy, not because I’m Italian. I would make some really nice pasta for Sergio with a special sauce Laughs.